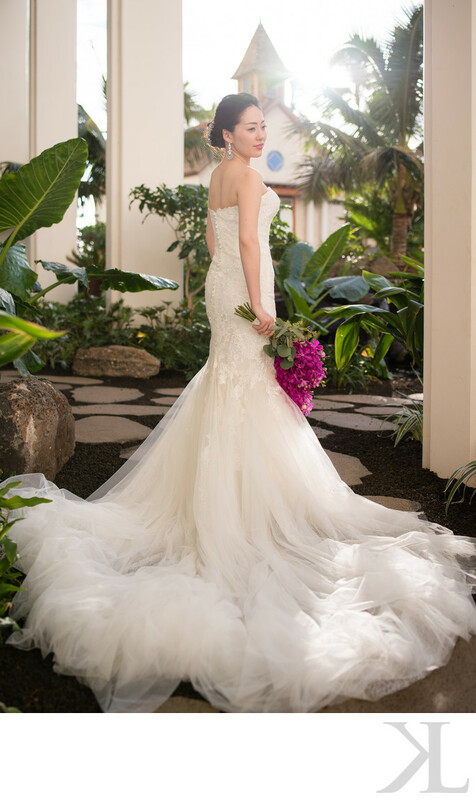 The new wedding chapel and its surrounding area at the Four Seasons Oahu is a great place to shoot portraits at almost any time during the day. In the morning as well as late afternoon, there is a good amount of open shade, with a lot of features to do a lot of different shots from a variety of angles. On this day, I was heading toward the chapel when I noticed a nice open shade area with a great view of the chapel in the background. After I placed the bride in her position, the sun peeked out from the behind the clouds, which made the shot extremely difficult to capture from the angle that I chose. Looking through the viewfinder was a significant challenge, as I was looking directly into the sun. I had my client show off the back of her gorgeous Pronovias wedding gown, while looking off to the side to emphasize that this was a photo of her dress, and not a portrait of her face. This also allowed her to be in a comfortable pose, because she didn't need to turn her head all the way toward me. A lot of shots like this also usually features the bride facing away from the camera, which would also have been difficult for this bride because she might have been forced to squint her eyes, which could have shown in the pictures despite her looking away from the camera. I had a limited amount of space to work with, considering the low angle that I wanted to shoot at to feature both her full dress as well as include the wedding chapel in the background to add environmental interest and provide context. This photo was taken in completely natural lighting, without the use of flash or reflectors, so it helped a lot to have the white columns and the white walls behind me to bounce light back into her face so that she wouldn't render as a silhouette in this extremely backlit situation. I had also been using my brand new Tamron 35mm f/1.8 Di VC USD lens, which handled the shot with minimal flare and no chromatic aberration. Because I don't like to shoot at the same places over and over again, I wanted to make this shot at the Four Seasons Oahu very special, and I'm very happy with the result. I would have loved to spend more time at this particular spot, but like I said, this area offers a lot for a photographer to work with, and I was anxious to photograph this couple in several other spots in this area near the Four Seasons Oahu wedding chapel, which features a couple of bridges, a variety of plants, trees, flowers, and koi fish ponds. I really look forward to shooting my next wedding at the Four Seasons Oahu in Ko Olina. It is a great wedding venue that offers a lot of nice photographic opportunities. Location: 92-1001 Olani St, Kapolei, HI 96707.